Admittedly I’ve joined the nail polish cult. I just think it’s fun and fresh that so many unique ideas are popping up. Are you bored of all the nail polish posts? 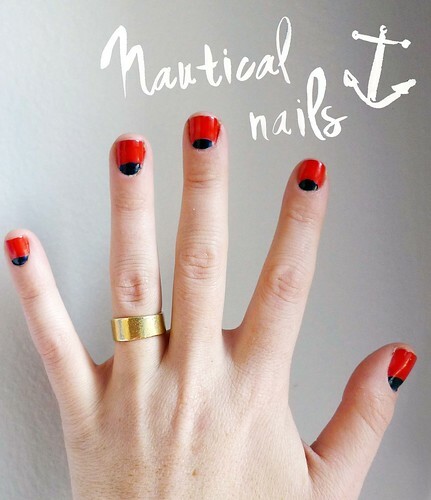 I love nautical things and grabbed some polishes out of my collection to try my hand at a reverse French (*disclaimer, this is hard to do on yourself!). I need practice for sure but I like the mix of these two colors. Do you think you’d try it or is it too much?! Any nail polish trends I should know about? Do tell. They match your b’day gift bag!! Maybe I can do your nails at Leigh’s? I know you think they’re too stubby but I love short nails!